And they compelled a passerby, Simon of Cyrene, who was coming in from the country, the father of Alexander and Rufus, to carry his cross. And they brought him to the place called Golgotha (which means Place of a Skull). And they offered him wine mixed with myrrh, but he did not take it. And they crucified him and divided his garments among them, casting lots for them, to decide what each should take (Mark 15:21-24). 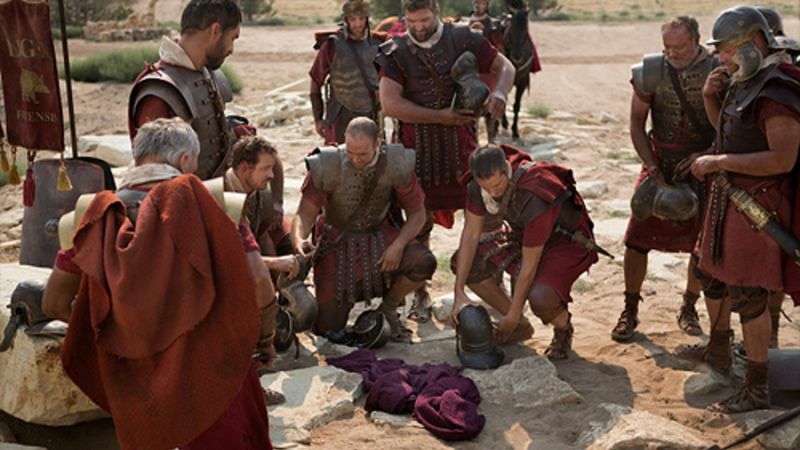 Officially, the Roman government executed Jesus on a cross. The Jewish religious leaders had requested his execution after having arranged for his betrayal and arrest with Judas, one of Jesus' apostles. The crowds who gathered before the Roman governor, Pilate, called for Jesus' crucifixion and the release of a terrorist named Barabbas. 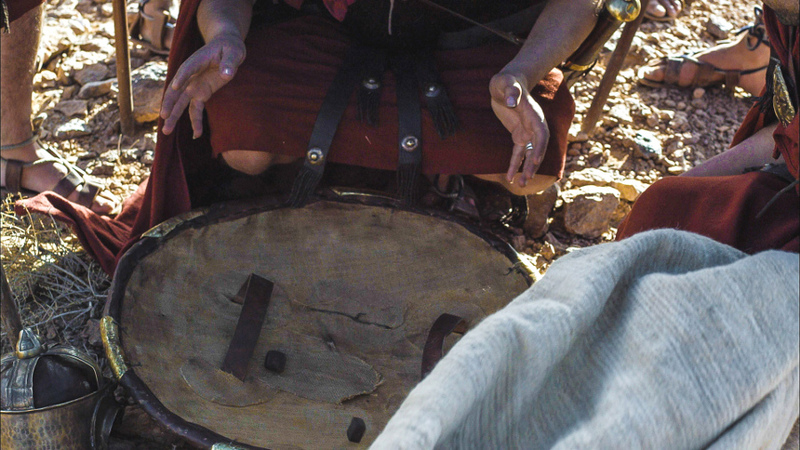 The soldiers beat, mocked, and scourged Jesus. A stranger, Simon of Cyrene, was forced to carry Jesus' cross because the Lord's friends had all forsaken him. Soldiers nailed Jesus to the cross to let him suffer before a gawking and mocking mob. These soldiers then callously gambled (casting lots) over Jesus' clothes while his naked and battered body hung before the mob as he gasped for breath and as his body was slowly drained of life by the torturous ordeal. The soldiers at the cross, however, were not the only ones who gambled at Golgotha. 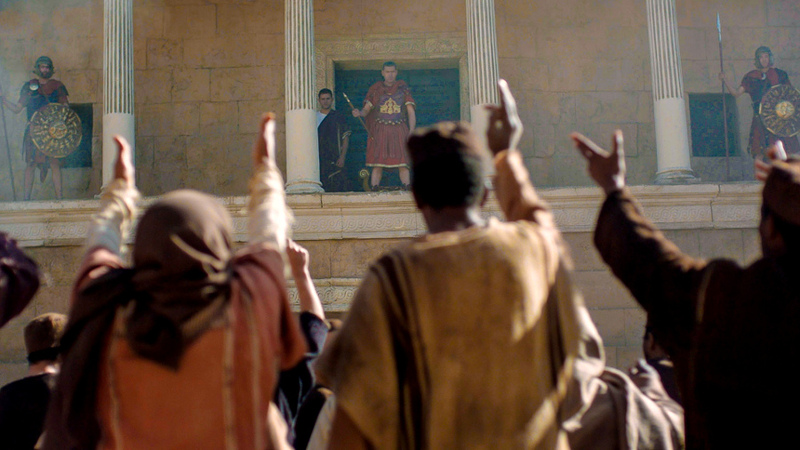 Pilate fearfully bet that Jesus was not whom his followers claimed him to be. He hoped to pacify the Jewish leaders and their mob with Jesus’ crucifixion. 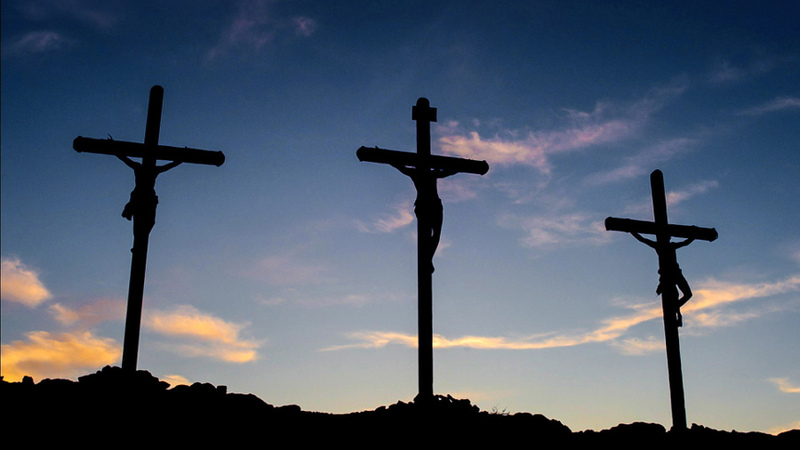 The religious leaders risked that they were going to get rid of Jesus once-and-for-all by having him crucified. The crowds gambled that their lust for blood had landed on the right scoundrel. Each of these gambles was wrong: dead wrong. Except, Jesus was the one who was, for a time, dead. The biggest gamble, however, was the one made by Jesus. The Lord knew the swirl of events around the cross was a gamble. Yes, I believe that Jesus is God come in human flesh. Yes, I believe that Jesus has the power to know all things. Somehow, however, Jesus willingly gave up some of those privileges, those powers, to be mortal like us (Philippians 2:5-9). He surrendered those, along with his desire for physical life, in obedience to the Father’s will. He had repeatedly made that choice — first, when he chose to be God-in-human-flesh who was born of woman, born under the Law given to Israel in a world broken by sin, death, and hell (Galatians 4:4). Jesus called them together and said,... "For even the Son of Man did not come to be served, but to serve, and to give his life as a ransom for many" (Mark 10:45). Somewhere along his way into Jericho (Mark 10:46), Jesus knew that the walls that blocked his disciples understanding were not going to fall. They were not going to "get it" — with the "it" being the purpose of his mission, the necessity of his death, the certainty of his rejection by his people, his humiliation at the hands of Roman soldiers, and his ultimate triumph over sin, death, and hell in his resurrection. On the journey to Jerusalem to his cross, Jesus recognized that he was going to die alone. He was fully aware that he was going to be tortured and murdered with no other human who understood what he had to do and what it would cost him. "Do you now believe?" Jesus replied. "A time is coming and in fact has come when you will be scattered, each to your own home. You will leave me all alone. Yet I am not alone, for my Father is with me" (John 16:31-32). He trusted that the Father would not abandon him to death (Acts 2:25-29) but would lead him in triumphant procession over the powers of demons, death, and hell (Colossians 2:15; Ephesians 4:8-9; 1 Peter 3:18-22). Jesus felt abandoned, but his trust in God triumphed over his feelings. His faith won out over his fear. He believed God would intervene and bring him victory out of apparent abandonment, torture, and impending death. You and I, dear friend, are testimony that God was faithful to his promise not to abandon Jesus on the cross. We are God's children because Jesus was faithful in delivering God’ grace to us through the cross despite its inhumanity, loneliness, and indignity! So, here is the "deal": the "deal" that we must feel down to the core of our being. There was a point before Jesus arrived in Jerusalem that he knew all that he was about to face. Jesus knew it not just because he was God, but also because he could see the confusion in the faces of the men and women he deeply loved. These folks in whom the Lord had invested the last three-plus years of his life, were clueless. Jesus knew what this path to Golgotha was likely going to entail, yet despite his disciples’ willful ignorance, Jesus gambled everything on his disciples "getting it" after he had gone to the cross and triumphed in his resurrection. He trusted the Father’s mission and the drawing power of the cross to capture the hearts of his misguided followers and inspire them to reach the lost people of the world (John 12:23-28; Matthew 28:18-20). Jesus knew that the walls that blocked his disciples understanding were not going to fall. Going a little farther, [Jesus] fell to the ground and prayed that if possible the hour might pass from him. "Abba, Father," he said, "everything is possible for you. Take this cup from me. Yet not what I will, but what you will" (Mark 14:35-36). And calling the crowd to him with his disciples, [Jesus] said to them, "If anyone would come after me, let him deny himself and take up his cross and follow me. For whoever would save his life will lose it, but whoever loses his life for my sake and the gospel’s will save it. For what does it profit a man to gain the whole world and forfeit his soul? For what can a man give in return for his soul? For whoever is ashamed of me and of my words in this adulterous and sinful generation, of him will the Son of Man also be ashamed when he comes in the glory of his Father with the holy angels" (Mark 8:34-38 ESV). Is faith a risk? Is it a gamble? Will there be times when we feel abandoned, alone, and forsaken? Will we have to hang onto to faith because we have determined to trust in God’s promises when everything else seems to point in another direction? Yes! Yes! Yes! And, yes! But, as in everything, Jesus has gone before us. He did not ask us to make a gamble that he wasn’t willing to make. Jesus chose to be the pioneer of genuine faith in a life full of risks (Hebrews 2:10-15). Our Lord now asks us to look at the cross, to believe in his resurrection, and to place our life’s wager on him, his sacrifice, his mission, and his victory! So, in whom or on what are you gambling your life? The cross of Jesus is a reminder that a whole lot more is on the line at the cross than soldiers casting lots over Jesus’ clothes! What we decide about Jesus and his cross matters eternally for us. Will you see Jesus’ journey to the cross as your call to decide to follow him more passionately? I don’t know about you, but like Simon who carried Jesus’ cross, I feel compelled by Jesus’ love and sacrifice to take up the cross and follow him. I’m gambling everything in life on Jesus. I pray that you will, too! Special thanks for the use of the Jesus images in Phil's posts, "The Jesus Window," to Free Bible Images and The Lumo Project. "Cruciformed #6: The Gamble" by Phil Ware is licensed under a Creative Commons License. Heartlight encourages you to share this material with others in church bulletins, personal emails, and other non-commercial uses. Please see our Usage Guidelines for more information.